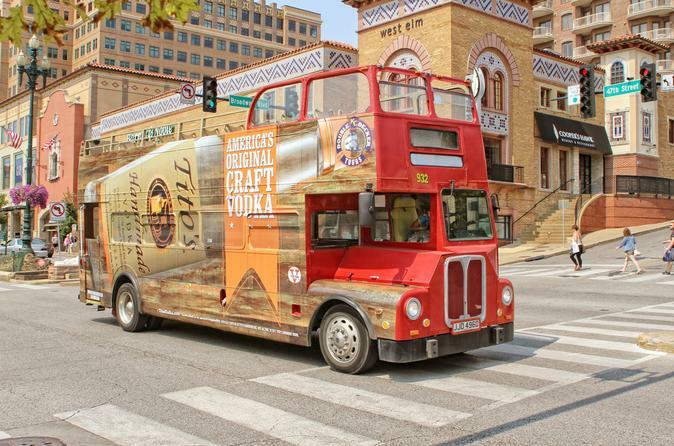 Our Hop-On Hop-Off Kansas City sight-seeing bus service is easy and fun. After purchasing your pass, board the bus at any of our designated pick up locations and enjoy the ride until you reach a part of the city or attraction you would like to see in more depth. Then, you're free to hop off and explore at your leisure before re-boarding and continuing the tour. Our brochure provides a detailed timetable and bus schedule, helping you plan your day with ease and accuracy. Choose when and where your fun in Kansas City begins! With the Hop on-Hop off Day Pass you are welcome to catch a ride at any of our designated meeting locations through out the city and hop off at any of the following locations through out the day. The double decker bus will pick you up and drop you off in the heart of the Country Club Plaza, Crown Center, River Market, Westport and The Power and Light District in Downtown Kansas City or at the door step of the National World War I Museum, the Nelson-Atkins Museum of Art and Boulevard Brewing Co. Tours begin at 10am. You are welcome to catch the bus at your convenience. Once you hop on, Kansas City is yours for the day! All hop on-hop off guests are welcome to get on and off the bus multiple times during the day.